Make it simple this summer with this fresh Cucumber Salad with Pickled Onions. Now, I know what you are thinking. Pickled onions? I promise that the preparation takes literally minutes and the taste is totally worth it! The pickling brine is all of five (count ’em five) ingredients. You read that correctly. Rice vinegar is whisked together with grainy Dijon mustard, sugar, salt and pepper. Toss with thinly sliced red onions and wait at least 15 minutes. They turn this bright pinky/red. For a milder flavor, you can rinse the onions under cold water before adding the brine. Alternately, the onions can be prepared a day in advance and refrigerated overnight. Just be sure to put them in a covered (preferably glass) container so they don’t ‘flavor’ the rest of the items in your refrigerator. 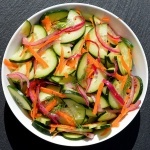 All that’s left is to thinly slice the cucumbers, shred a few carrots and chop some fresh dill and this becomes the easiest, most delicious Cucumber Salad you will ever make! Need a few more ideas for summer sides? Don’t worry, we’ve got you covered! How about this Easy Vegan Coleslaw. Or how about these Brown Sugar Barbecue Baked Beans? Combine the vinegar, mustard, sugar, salt and pepper, whisking until combined. Add the sliced onions and let sit for at least 15 minutes (or overnight). You will know they are ready when they turn a bright red. Add cucumber slices and grated carrot. Toss to coat. The mustard mentioned is not listed with the ingredients. Sorry, Debby it’s fixed now. The measurement is 2 Tbl. How much mustard do you suggest? Thanks! Hi Eva-Marie, sorry for the omission. It’s 2 Tbl of the mustard.